In September 2017 Gyangkhang Rinpoche came to London, and while here he asked me to take responsibility for Palyul Center UK. I also received words of encouragement from Muksang Kuchen Rinpoche. 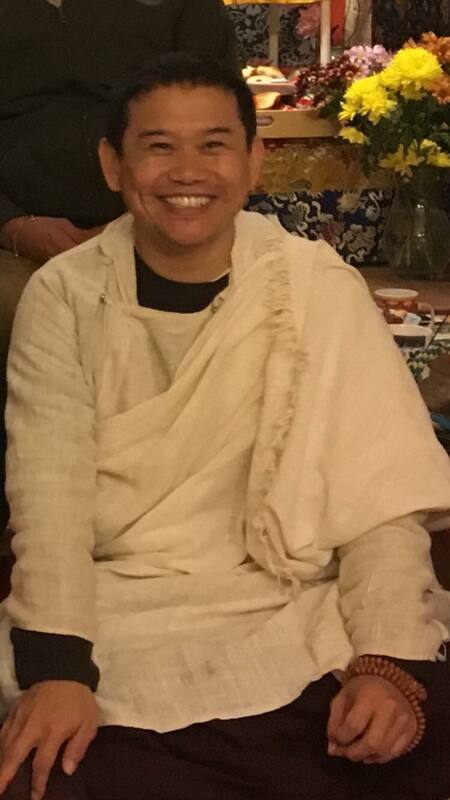 Last November, Kyabje Karma Kuchen, the 12th throne holder of the Palyul Lineage, visited London and he confirmed my position, so in December 2018 I officially became Director of the Palyul Centre UK. I am very honoured to serve my root guru HH Penor Rinpoche in this way. I am also grateful to Khenchen Pema Sherab Rinpoche and Khenchen Tsewang Gyatso Rinpoche for their support and blessings. In February I am going to see Khenchen Namdrol Rinpoche to receive his teachings and blessings in Nepal. I always consider these six great teachers as the embodiment of the six Paramitas of the late Kyabje Penor Rinpoche. Lama Dawa and I will strive to assist you to the best of our abilities, but am sure you will appreciate that we are 100% volunteers and therefore it is not always possible to do everything that we are asked, despite our best intentions. Tashi Deleck for Tibetan New Year!